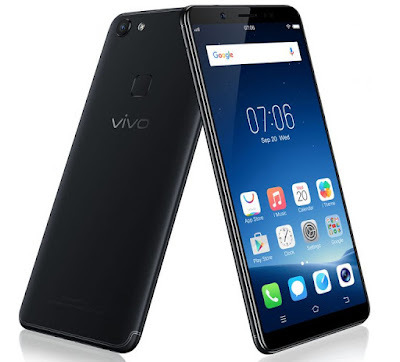 Vivo has launched Vivo V7 smartphone in Indonesia.It has a 5.7-inch (1440 x 720 pixels) FullView display with 18:9 aspect ratio, narrow bezels, and 83.6% screen-to-body ratio powered by an Octa-Core Snapdragon 450 14nm Mobile Platform with 4GB RAM and 32GB of internal storage. On Camera it has a 24-megapixel front-facing camera with LED flash, Face Beauty 7.0, Face unlock and Portrait mode and a 16-megapixel rear camera with phase-detection auto-focus (PDAF) and LED flash. It runs on Android 7.1 (Nougat) based on FuntouchOS 3.2. It has dedicated dual nano SIM and microSD card slots arranged in a single tray. Packed with a 3000mAh battery. Vivo V7 comes in Matte Black and Gold colors priced at Rp 3,799,000 (Rs. 18,325 approx.) in Indonesia and goes on sale from November 18 Vivo V7 to launch in India exclusively on Flipkart on November 20th.